Summer's here. Well kind of. At least if you are a U of M student, school is out. And you know what that means: summer reading lists. 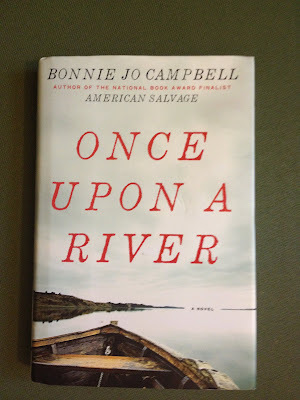 This summer I'm planning on reading Bonnie Jo Campbell's "Once Upon a River." The story takes place in rural Michigan on the Kalamazoo River in the 1970s. And it has a lot of things I like in a story: the woods, the river and huntin'. If I'm up for it, I might also check out "Q Road," another Campbell's books. So how about it gentle reader? What's on your summer reading list? I did join that book club, but can't make the 13th. Nevertheless, I ordered the book via MelCat and it arrived today. I am reading a book about Freud and cocaine. It's a slow read, so far. Q Road is really excellent. I recommend it. Bonnie Jo taught my independent creative writing study in my senior year of college. She is a badass. I'm reading "Q Road" right now! Although it was written afterward, "Once Upon a River" is the story of the mother of the main character in "Q Road." I read the last 90% of "Once Upon a River" all in one night--I could not put it down. Margo is such a complex character, a real tough nut to crack, and I don't think I'll ever understand her completely. I just got up to thumb through the copy of this book that BCB gave me for Christmas to try to understand Margo a little better. Only to realize that my copy is there, in the photograph, with BCB, all the way down in Ann Arbor. Great gift, sweetie.